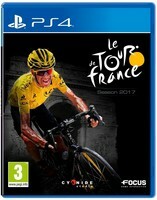 I am grateful Family Friendly Gaming was given a digital downloadable code for Tour de France 2017 on the PS4 for this review. This cycling based video game can be difficult if you do not know how to play it. There is a tutorial which offers some great tips. The biggest one I can give you is do not hold down R2 all of the way while pedaling at first. If the circular bar on the screen is past that blue line then you will lose blue bar health very fast. What happens if you use up your blue or red bars in Tour de France 2017? Then you will blow up, and lose all of your stamina. This is a bad thing. Knowing when to attack and when to conserve is key to victory in Tour de France 2017. There are physical copy versions of this game available so you will not run into issues with downloads and Internet plans. We ran into multiple issues with Tour de France 2017. The download size of Tour de France 2017 is 23.3 gigs. Family Friendly Gaming had to delete multiple games to make room for Tour de France 2017. Sony had some issues with their servers and it took us a couple of days to download this game. The download would error out and have to start all over from the beginning. The music in Tour de France 2017 is really nice. The graphics look good, although there are not many character models for the racers. You can spend a long time in one race in Tour de France 2017 too. It can be difficult to break away in Tour de France 2017. Holding down the button partially is really uncomfortable. I wish there was a better control scheme there. The controls can also be confusing the first couple of races. The coolest thing to me about Tour de France 2017 is the local co-op mode. Two family members can enjoy Tour de France 2017 at the same time with the split screen. The modes in Tour de France 2017 are Tour, Pro Team, Challenge, My Team, Training, Editor, Manual, Options, Credits, and What's New. There are multiple difficulty settings for families of different skill ranges. I like Tour de France 2017. It is one of those video games that teaches us patience, perseverance, timing, planning, and more. I wish it was easier to see the climbs and descents. When you sit down to play Tour de France 2017 make sure you have enough time set aside. I hope this franchise continues in the future. It was a pleasure for me to play and review Tour de France 2017.